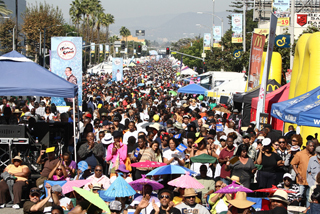 The official opening ceremony had yet to begin when tens of thousands started to flood Crenshaw Blvd. for the 8th annual Taste of Soul ‘Family Festival, which again exceeded its expectations of attracting more than 350,000 attendees Saturday. As morning shade gave way to gleaming sunshine and the favorable smell of smoke from the culinary experts puffed skyward, bands and song blasted the sound of a momentous celebration while Crenshaw Blvd. transformed from a traffic filled street to a sea of people. 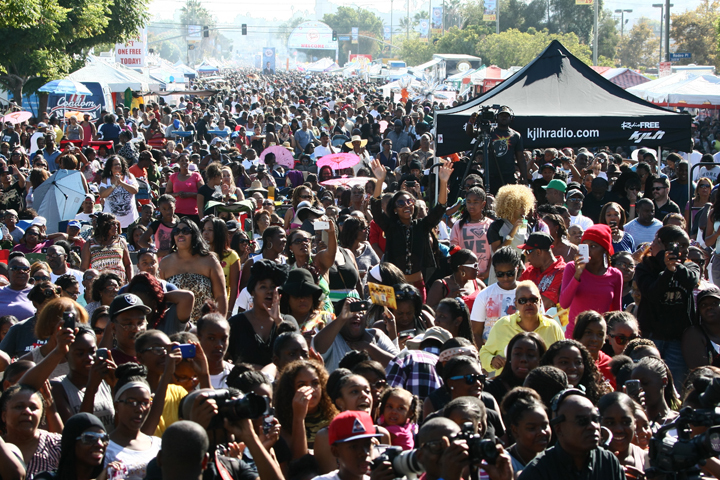 The Taste of Soul Wave stage, which occupied Stocker Ave., the Taste of Soul Radio Free KJLH stage, which occupied Rodeo Road and a variety of 400 authorized vendors sandwiched in between, offered something for everyone. If the taste buds screamed for some of the best seafood, a fruity cone of ice, Jamba Juice, chicken and waffles, or if anyone wanted or needed an HIV test, a mammogram screening from Watts Healthcare Foundation, free goodies from Food 4Less, tips on public transportation from Metro, elderly health care from AltaMed, an up close look at the new Chevy Impala or Toyota, banking services from Bank of America, Wells Fargo or Chase, a pair of Nike’s or even a pawn and loan shop, Taste of Soul provided it. Gospel grabbed the spirit and StarQuest and StarQuest for Kids introduced fresh untapped talent on the second annual StarQuest stage sponsored by Fox. Twelve-year old Noah Maples captured StarQuest’s first place on the kid’s stage and Nathan Dans, Jr. wowed the judges to win the second annual StarQuest contest. Local television news personalities were represented on the StarQuest stage with Christine Devine and on the Taste of Soul 94.7 Wave stage with the adorable Pat Harvey, which rocked with Patrice Rushen. Young Black mothers carted their toddlers in baby strollers, physically challenged seniors motored up and down Crenshaw Blvd. on the motorized chairs and massive groups of men and women between he ages of 18-50 took ownership of Taste of Soul as if it was their family reunion. Residents and local businesses nestled along the east and west side of the street of Crenshaw Blvd. took advantage of the abundant foot traffic by opening their doors earlier than usual. They too experienced what the scores of Taste of Soul vendors have taken advantage of throughout the history of the event, a unique out pouring of increased business that not only provides a tremendous financial uplift for the day, but also sustains them the whole yearlong. Some groups of dancers and singers who either did not audition for StarQuest or did not make it to the finals at Taste of Soul, made sure their presence was felt nonetheless by singing and dancing in the middle of the street drawing their own private gathering. Other acts, some that frequent Hollywood Blvd. crashed the Taste of Soul and set up shop where they could, for additional notoriety and or donations. Then of course there were the opportunists who pushed cold plastic water bottles into their pockets, two at a time and walked the boulevard to sell at a discount of what the paid vendors offered. Others were bold enough to establish their own booth in businesses drive ways and store fronts that were closed for the day, offering wooden arts and raffle tickets for the children schools for a buck or two. One of the chairs of the event, Los Angeles Mayor Eric Garcetti hailed, “It’s time for us to put recession in the rearview mirror, and anyone can tell you as your 42nd Mayor that’s what I’m focused on.” Taste of Soul was the ideal venue to delivering that message because progression and not recession was in full swing. “Enjoy the food, enjoy yourselves, enjoy the day, take care,” encouraged L.A. City Council President Herb Wesson to the massive gathering. Los Angeles County Board of Supervisors Chair Mark Ridley-Thomas explained how delighted that he was to be at Taste of Soul. Other electeds who attended the event included Congressional members Maxine Waters, Karen Bass and Janice Hahn, City Councilman and co-chair Curren Price, Assembly members and co-chairs Isadore Hall, III and Reginald Jones-Sawyer. “Taste of Soul was created for you! This is our community and we want everybody to know and appreciate our community and we love one another,” emphatically concluded taste of Soul Creator and Founder Danny J. Bakewell, Sr.
And, thus the plans for Taste of Soul in 2014 begin!